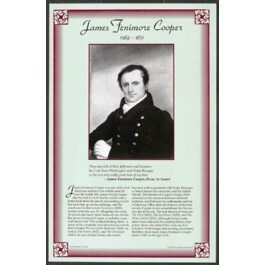 This unique educational poster features an artist's rendering of the great 19th century American authors James Fenimore Cooper, as well as a quote from "Home As Found," and concise biographical text summarizing his life and career. 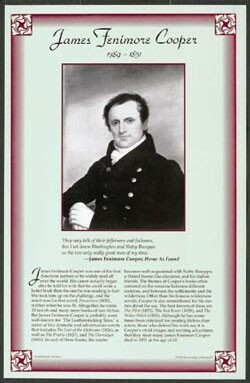 James Fenimore Cooper was one of the first American authors to be widely read all over the world. He is best known for a group of five dramatic adventure novels that include "The Last of the Mohicans," and "The Deerslayer." This poster is a great way to introduce students to this classic American writer.